we have added some more nice features during the last couple of weeks. Besides adding new devices, we have implemented the discovery of virtual machines which are currently offline. This feature is implemented for VMware and Citrix XenServer first. Over time, we will add this feature for the remaining virtualization technologies. We also improved the discovery of displays attached to computers. Besides getting basic monitor information, JDisc Discovery determines the panel’s physical size. JDisc Discovery has improved the monitor discovery for Windows computers. Up to now, we were getting monitor information from the Windows registry. The limitation for this approach is that the registry only contains data if the monitor was switched on before you start your computer. Therefore, we changed the monitor discovery in order to get the list of attached monitors in all cases. In addition, we also determine the panel’s physical size. JDisc Discovery now also determines the list of virtual machines which are not running. We have implemented this feature first for VMware and Citrix XenServer. The remaining virtualization technologies will be added over time. The virtual machine list for ESX servers has a new column called state. The state reflects the state of the discovery at the ESX server’s discovery time. However, if we later find out that a stopped VM can be actively pinged and discovered, then we change the state to “running” because it is obviously running. 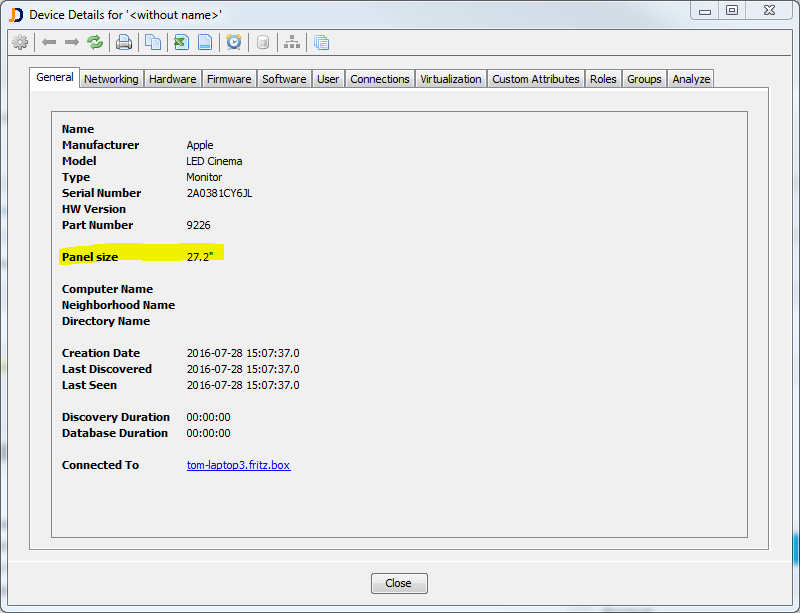 The device details dialog has been extended with the status field for virtual machines. For each virtual machine, we list the current state at the time when the ESX server has been scanned. The virtual machine state has also been introduced to virtualization browser. The display size discovery has been introduced with build 3339 and the virtual machine state with build 3342. Hope you like these new features. Looking forward to receive your feedback.